Oxford Cottage is a charming and very comfortable B&B situated in a quiet and particularly sought after part of Franschhoek. Within walking distance of the historic village, Oxford Cottage offers luxury accommodation with secure off-street parking and scrumptious home cooked breakfasts. The property has majestic views of the valley and a delightful pool area to enjoy. Boasting some of South Africa's finest restaurants, award winning wines and magnificent walks, Franschhoek is rated one of the countries top destinations for visitors both nationally and internationally. Bird enthusiasts may be spoilt with sitings of Buzzards, resident Cape Spotted Eagle Owls and even the elusive Black Eagle. 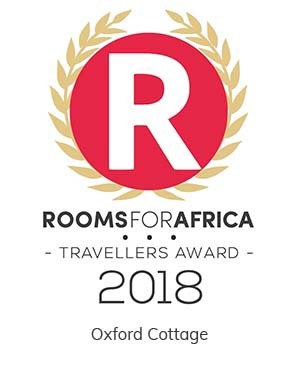 You will find information on the diversity of things to do and places to visit from the manager of Oxford Cottage, including where to hire bicycles within walking distance from the B&B and which wine estates to visit-some offering exceptional dining venues. Each of the three double rooms are equipped with a fridge and kettle, flat-screen TV and hairdryer. All rooms have exclusive use bathrooms, with the master bedroom offering both a bath and a shower en-suite.